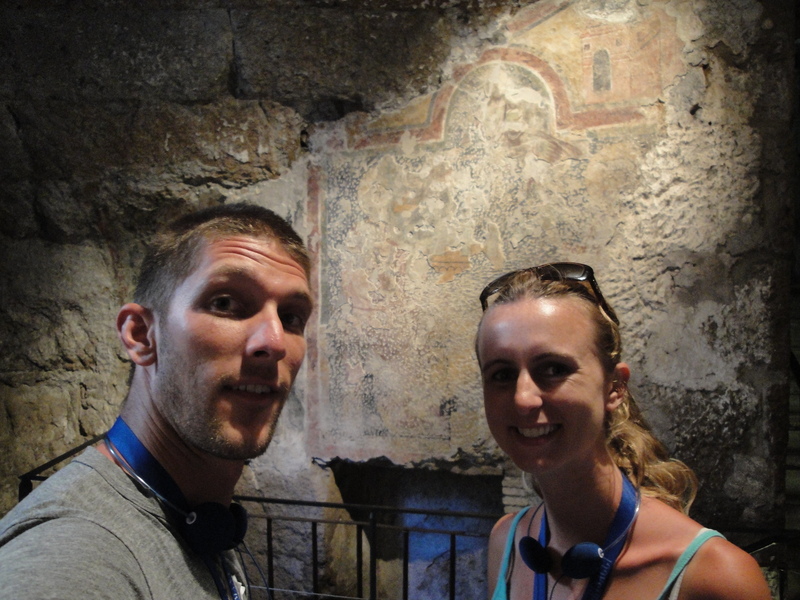 Rome Day 2 starts off with a list of “must sees”. The usual suspects are all on the list. 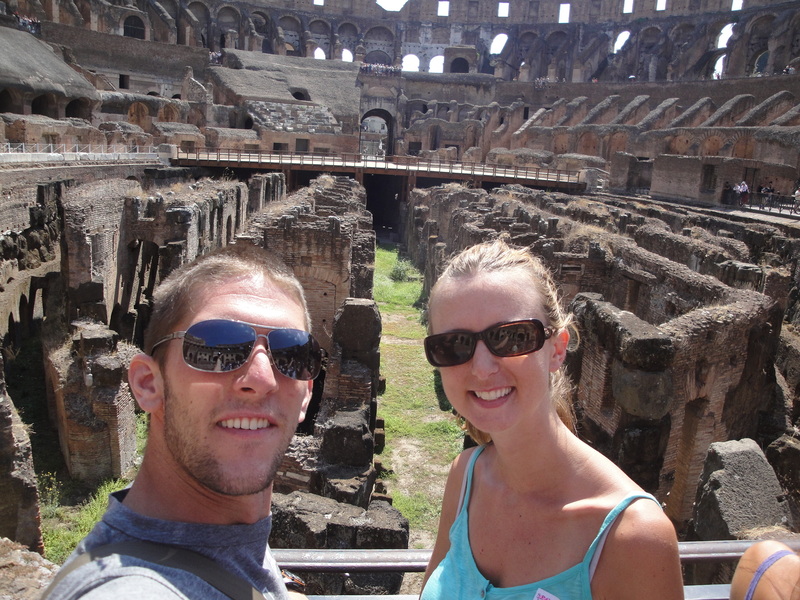 The Colosseum, the Roman Forum, Paul, and Peter’s prison, the Trevi Fountain, the Pantheon, the spanish steps. Plenty of really old places guaranteed to be filled to the brim with fellow tourists. We begin our journey with the Colosseum. We opted for the guide which turned out to be a complete waste of time and money. They bait and switched us. The really friendly, nice, outgoing guy who spoke great English signed us up for the tour then dropped us off with our actual tour guide. This fine professional did not seem to know English very well, and she definitely could not speak it very well. I understood very little she had to say. After a while of trying, I finally gave up and began to just read the signs that they had up everywhere. Getting past the bad tour guide and the mass of people (both difficult tasks for me to do) I actually enjoyed the Colosseum. Pretty cool to think about how long this big stadium has been here and that people actually fought to the death just a few feet from where I stood. Walking around this big arena made me wonder. In 2000 years will people be paying for bad tours and walking around a big “football” stadium, learning about how Jerry Jones once upon a time built the largest TV screen of the time? Will people think it was so bizarre that 100,000 people used to cram in there to watch people throw around a pig stomach? If you really think about it, not a whole lot has changed in two millennia. Next on the list for the day is the Roman Forum. This is basically just a giant archeological dig site where all the ancient Roman ruins are. This place was the center of Rome back in the height of their empire. 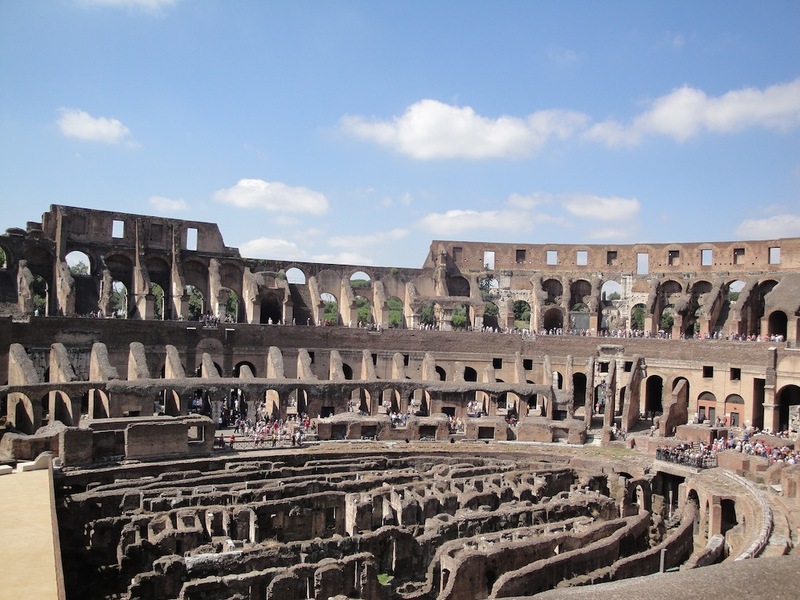 Included in the price of our Colosseum tour was a tour of this place. Lucky for us we got a different tour guide. This guy was much better. British guy with a sense of humor. He made the hot afternoon in a hole filled with really old rocks…. bearably pleasant. Apparently, to go along with all of these really old rocks, there is a story. Tour guide Luke told us these stories in a very entertaining way. It was cool to hear all that world history that I so quickly ignored in my 6th grade history class. Next in line for team Zarse is the Mammertine prison. 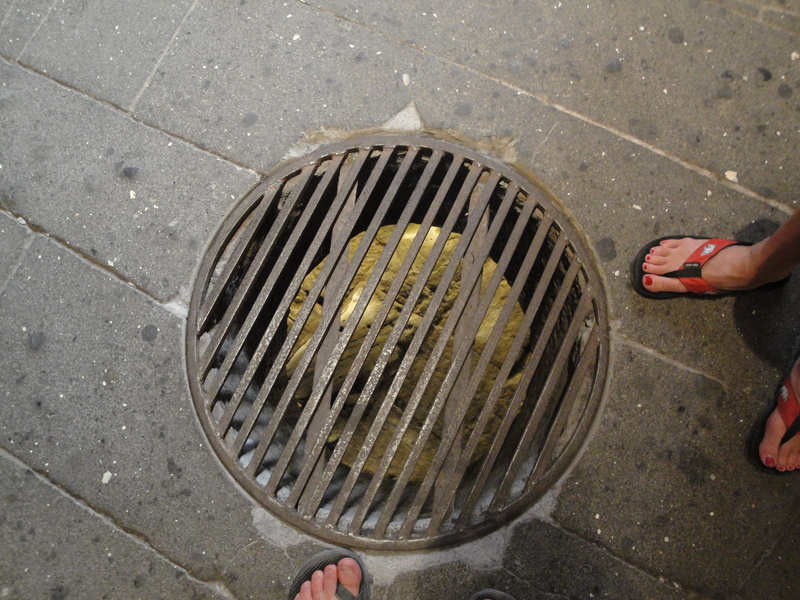 This is supposedly where Peter and Paul were imprisoned. This place was something else. It was neat to see the prison but the company running the tour was beyond weird. They put together this “spiritual journey” audio guide thing that was so cheesy it was hard to keep a straight face around the tour people. Beyond being cheesy it bordered on being straight heresy. The worship of Peter in this place is just sad to see. One thing I need a little clarity on. When we went to the prison they said that Peter and Paul both stayed in this prison and that Peter converted and baptized jailors here. They say that there was a miracle in that a spring came up from the cell and produced the water they used to baptize the jailors. I, unfortunately, am a little hazy on some of my bible history. I went and tried to find this story in the bible and was unable to find it anywhere. I was unable to find a place in the bible where Peter converted jailors. I was able to find where Paul converted jailors. That however could not have been in this jail. This jail we visited had no prison doors. Just a hole in the ground where they put the prisoners in. Acts 16 says there was an earthquake that shook the doors off the cell. Here there is no cell, and no doors. Can’t be the same story. Maybe I am missing the right passage. If anyone knows more on the subject let me know. 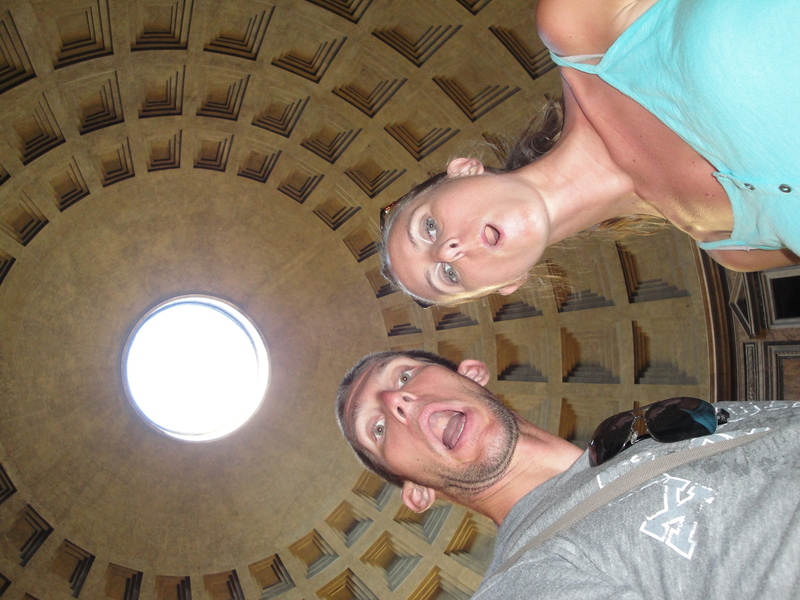 Next we make a quick stop at the Pantheon. Here is what we know about the Pantheon. It is a large building. It has a dome at the top. This dome has a hole in the top of it. It probably has some sort of Roman historical significance. That is about it. Moving along we head over to the Trevi Fountain. 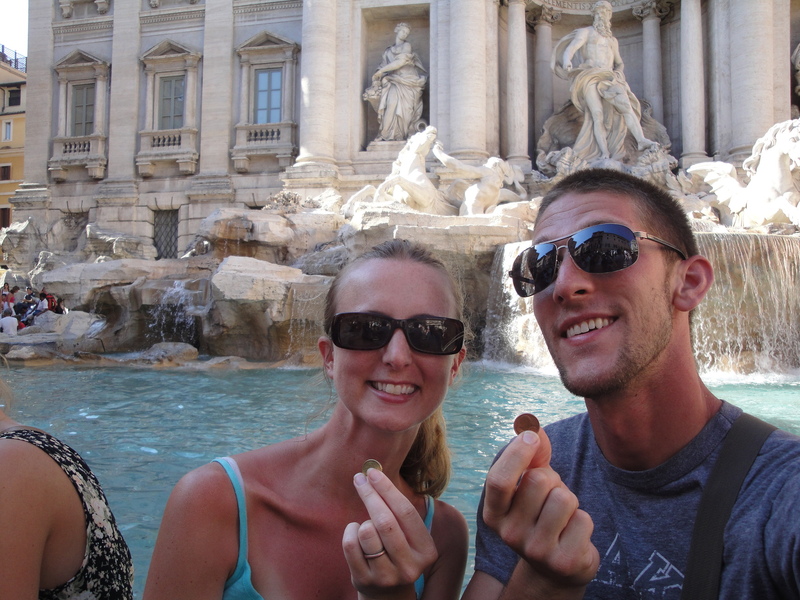 The deal with this place is that if you throw a coin into the fountain you will fall in love. Why is it that if you throw a coin in you will fall in love? Well because that is what happened in the movie silly. Good thing I skipped the gelato vender before we got here because it would have been awkward if I spent my last coins on ice cream instead of falling in love with my wife. But alas I did not buy the ice cream, so Steph and I could throw the coin in and be in love. Whew. Close one. But does it still work if I chucked mine so hard it hit that statue guy in the forehead? 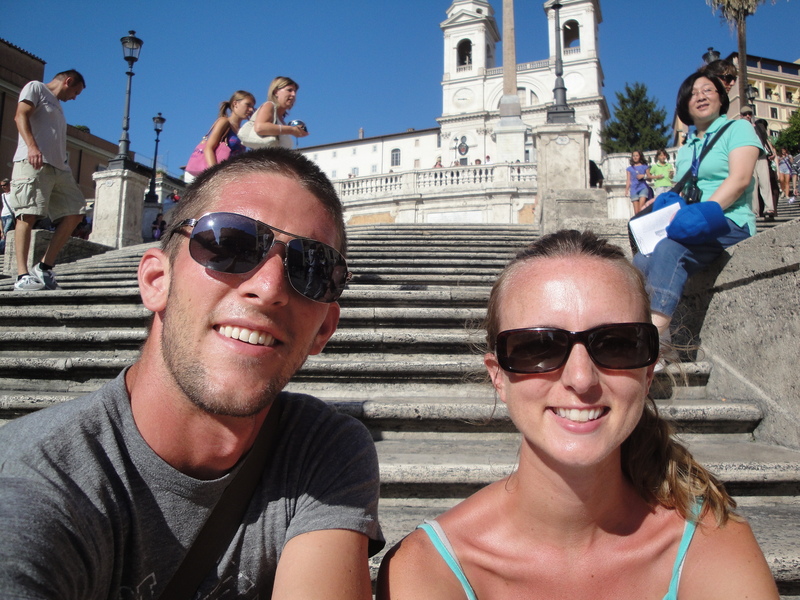 The last tourist attraction for the day is this place called The Spanish Steps. The deal with these. They are a bunch of steps which lead down to the mecca of shopping. We are told that this is the best place in the world to buy Armani, Gucci, Louis Vutton, Dulce Cabana. Apparently it is also the best place in the world to buy little tiny Colosseums, cooking aprons with Michelangelo’s David statue on the front, and kids squishy toys. We finish up the night with a little Italian cuisine. Tonight we decide to go all out and eat like the Italians do. We each ordered our own first course of pasta, then second course of meat, then we shared a dessert. We each get a pretty decent portion of pasta for the first course. I am not sure I am going to be able to eat more than that. Then comes the second course. 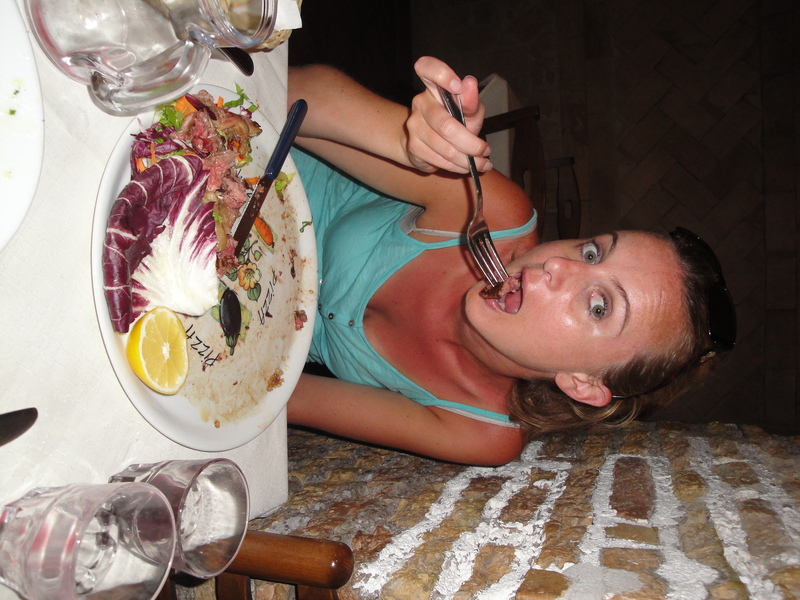 Due to the fact that we have been eating so much pasta recently my wife has been craving some protein, so she orders a steak. When this thing comes out I start laughing out loud. It is huge. The waiter said it was 350 grams. I am pretty sure that is about 12 or 13 ounces. It took up her whole plate. Then, as I watch in amazement, my wife, bite by bite, puts the whole thing away. Talk about a craving for meat, it was impressive. With the tourist juices flowing freely we head over to the Vatican tomorrow. With one more day of Europe left I would love to write a little piece about how we have felt about the trip as a whole, and how much we are looking forward to seeing all of you fine people. Unfortunately one month straight of running around the globe leaves one pretty tired. Another night perhaps. Stay tuned. 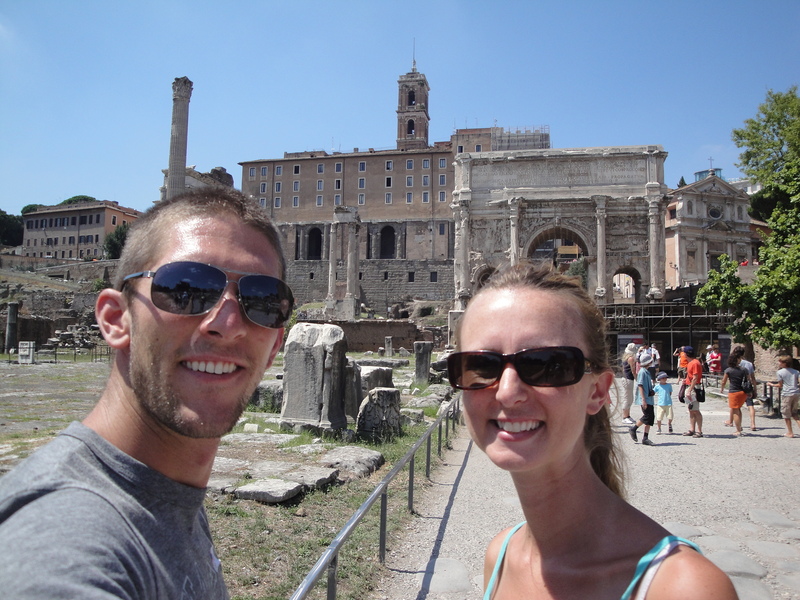 This entry was posted in Europe and tagged colosseum, roman forum, spanish steps, trevi fountain coin. Bookmark the permalink. There is no way to place Peter in Rome, ever. Paul even wroe to the church at Rome and in chapter 16 lists over 25 people by name and fails to mention the pope. Either a huge slam or he wasn’t there. I opt for the latter. But there is a huge business and a lot of money to taken from the likes of you two if they claim he was.